The large hexagon box is based on the “Tumbling Block” quilt pattern. It measures 7 ¼” X 13 3/8” and 2 3/8” high. Inside measurements are 6 ¼” X 12 ¼” X 1 ½”. There are 304 pieces on the overlay. The pieces are cut and glued in place, one piece at a time. The pattern covers the top and extends over the edge uninterrupted, to the bottom. The box is finished in its natural color with 5 or 6 coats of a clear wiping varnish, rubbed in by hand. The pieces are a bit over 3/16" thick, glued onto a Baltic Birch base, so hold up much better than a thin veneer. 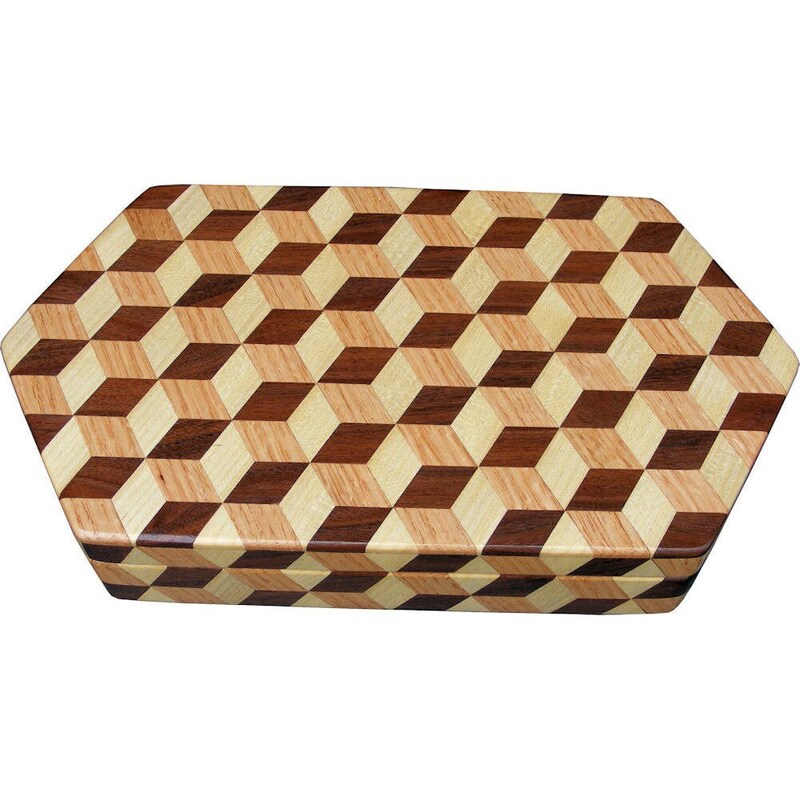 This box is made from “Hackberry, Oak, and Walnut, all native to Missouri. This box was made in 2011. On the bottom, I signed it, listed the wood, and dated it. After the date the words “Foot Cut” let you know I made it on a foot powered table saw. Go to my “Shop Polices” and “Profile” page to see my return policy and other information. To see other boxes I’ve made, click on “Small, Medium or Large Boxes” or whatever gets your interest under “Sections in this shop”. The “Home” page itself can be rather confusing with everything mixed up. The “Sections in this shop” lets me show you all like items together as a unit.